This entry was posted in Media, Questionable Science, Science Communication, The 'Consensus' and tagged climate models, consensus, David Rose, halt in warming. Bookmark the permalink. The acid test will be on this decadal projection over the next 5 yrs given that there is improved accounting for natural variability. But although the trajectory is radically modified downwards from 2011 it is still for “record” levels above 2010’s strong El Nino year level and 1998’s superstrong El Nino level. The record levels do not arise primarily from natural factors though from what I can gather but from the assumed “anthropogenic global warming trend” because there’s no natural factor on the horizon short of a superstrong El Nino to boost temperatures to record levels. If we take the average of 2012 as roughly 0.2 anomaly, then “record” levels in RSS terms are at least 0.4 higher (2010) or 0.6 higher (1998) than 2012 ENSO neutral levels. The lower confidence level if it eventuates would still be 0.25 higher than 2012. If this projected boost does not occur over the next 5 yrs, there cannot be a “background” anthro signal of any significance. And say La Nina dominates. That would mean oscillation BELOW 2012 levels i.e. cooling. There’s already a La Nina on the way for 2013 possibly and the PDO is in cold mode so La Nina could dominate for the next 20 yrs plus as La Nina did for the last 30 yrs with PDO in warm mode. Then there’s the solar recession upon us, that can’t boost warming. It’s only lagged ocean heat that will keep temperatures elevated but wont do any boosting. With solar forcing reduced, temperatures must decline at some point in the future – when? So if over the next 5 yrs temperatures even just maintain 2012 neutral levels on average, the tune that is sung will of necessity have to change.because the assumed “background” anthropogenic signal demands a rise.even at the lower limit by 0.25 C and at mid confidence by 0.4 – 0.6 C by UKMO’s forecast in RSS terms. The next 5 yrs are crucial for DAGW.now. Thank you Richard – as ever, a contribution that helps both myself and other readers. Ah yes, the typical denialist cherry-picking and dishonesty. Science deniers are apparently completely clueless about statistics, trends and variations. Or they are extremely dishonest and consciously try to mislead people. Oh dear, oh dear. Your link is nothing to do with the models. Completely off the subject that I posted about….and the escalator in any case does not represent the skeptical position. As usual, you serve to highlight your lack of engagement with anything that is written. My link has to do with science deniers declaring that the science is wrong because of short-term variations. The point is that science deniers ignore the long-term trend. The escalator does not represent the skeptical position because skeptics will come to accept AGW. It does represent the denialist position because you even did it yourself right here in this blog post: Cherry-pick something from a bigger whole and lie about it. Still no discussion of the models having been proved to be wrong, despite the certainty, consensus etc..
May I suggest a novel approach for you. How about addressing what is written in the post….or are you suggesting that the model predictions were in fact correct, that the halt in warming is fully understood, and that the science is settled, there is a consensus and there is nothing up for debate? If so, take a look at the article in Spiegel…. So have a go, answer the points in the post. Your claim that the models are wrong is based on the cherry-picking and dishonesty I’ve already pointed out. What I wrote specifically addresses the long garbage text you wrote. You have failed to address this, and instead tried to desperately change the subject. Typical denialist behavior. The link does indeed address your post because it shows how you deniers are cherry-picking data to misrepresent it. The escalator does NOT represent the “denialist” position or the sceptical position. It is a piece of junk. 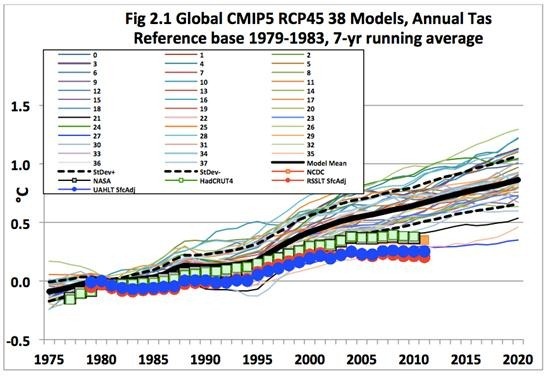 There are only 2 models that have got anywhere near the trajectory of observations: the Russian Academy of Sciences INM-CM4 model (blue line) right between satellites and surface-based series and an as yet unidentified model (black line) at surface-series level. The rest are rubbish because they have for accounted for natural variability in a realistic way. Now that UKMO has a decadal forecast with an improved model that goes some way to mimicing natural variability, the trajectory of it is similar to the black line model in the long-term projections. In other words, only 3 models have managed to achieve what models should do and what sceptics require (their position). The SkS/Rahmstorf, Foster and Cazenave (RF&C) “true background anthropogenic global warming signal” trajectory however, tracked the UKMO HadCM3 trajectory but the UKMO has abandoned that model because it was unrealistic i.e. SkS are now out on a very skinny limb. Sceptical Science have been gazumped by UKMO. Even Hansen, Sato and Ruedy have a different trajectory for the “background” warming (La Nina minimums apparently). It remains to be seen over the next 5 years if there will be any anthropogenically forced warming at all in the current climate regime, If not, AGW is dead. The rest are rubbish because they have [not] accounted for natural variability in a realistic way. Looks like I’m wrong here. The RF&C Fig 1 trajectory does intersect roughly with the 2016 peak in the UKMO 2012 projection. So the “true background anthropogenic global warming signal” in both SkS/RF&C and HadGEM3 will be tested over the next 5 yrs. As ever Richard, thank you for your efforts to clarify. Yes, it will be interesting to see whether this might see any changes anything. It brings to mind Judith Curry’s uncertainty monster. It brings to mind Judith Curry’s uncertainty monster. Thanks for the comprehensive summary. Lets hope the NZ Herald come out with some realistic comment on the 16+ years of no warming while CO2 continues to rise. This in itself show a disconnect of CO2 and world temperatures. If I had time, I would have liked to check the other major media, as I suspect there would likewise be a resounding silence…. Apologies for highjacking both of these threads at 2 blogs (NZCC and CCG), but I’m on a roll here and I think this is a very important juncture in the test of AGW validity (or not). But now that RF&C have immutably fixed the “signal” (according to them), they will NOT be able to pull down their 2010 pivot point level as new data comes in because they no longer have that liberty, the “signal” was fixed in their Fig 1. And for 2013 – 2017, RF&C will also have to “take out” any El Nino that may occur to be consistent in their method. Any continuation of their “signal” will have to be anthro-only – no El Nino’s allowed. Neither will they be able to “add in” any imaginary warming after their fixed 2010 pivot point to perpetuate the “signal” if observations after “taking out” El Nino’s do not produce higher levels relative to their 2010 Fig 1 pivot. Over the next 5 years, Foster, Rahmstorf and Cazenave (and SkS) are about to hoist themselves on their own petard unless there’s some radical warming in that time. Not hijacking Richard – informing and contributing. I have been following up, and am starting to see your point about their own petard. Interesting. That’s interesting, denier. Suddenly it’s OK to post completely off-topic comments, whereas you are constantly complaining about mine? Up to 2010, Foster, Rahmstorf and Cazenave had the liberty of “taking out” “exogenous factors” (e.g. ENSO, a bogus method but we’ll go with it here) and that worked to their advantage for fixing “the true background anthropogenic global warming signal”. Even the raw data shows a clear warming trend. What’s wrong with you deniers? Not this century it doesn’t and that’s the whole point. From 2002 HadCRUT4 and other series have a cooling trend (are YOU denying that BTW?). 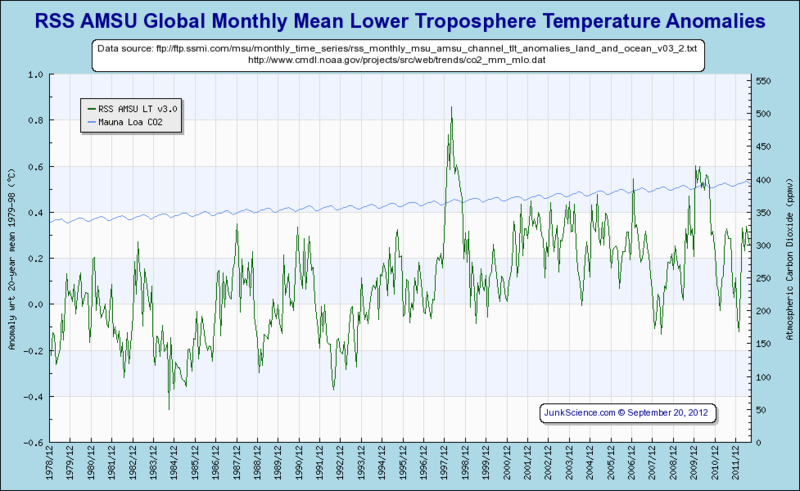 Consequently, AGW folks have to fall back on – after much data torture – a purported “background” warming trend. Even Hansen concedes the “standstill”. He then resorts to the fall-back and concludes “background” warming is continuing even during the standstill but his basis for it is so tenuous it’s laughable. Since 2010 that “background” trend of RF&C and models is now looking very suspect and time is putting AGW under an acid test. If even the “background” trend fails over the next 5 yrs as the actual trend has this century, that will make 7 yrs of “background” trend failure too and AGW will be dead snerkersnerk. You should be more cautious than confident. Snerksnerk, you seem to be in a bit of a tizzy. Reread the post, and follow the links in the post. The UK met office has accepted that there is a halt in the warming. Nobody can explain it satisfactorily, and it was not predicted in the models. You have been commenting on this blog accusing skeptics of being ‘denier’, ‘creationists’ etc. etc. but refuse to accept the halt, even when it comes from the UKMO. When you start to deny that warming is halted, as David Rose said, who is the denier? Perhaps some self-reflection would be a good idea. You seem to be making a fool of yourself. Look, you need to stop lying and deceiving. Apparently the difference between variations and long term trends escapes you. In fact, the response from the MET Office specifically points out this dishonest cherry-picking by the liar from the Daily Fail. Indeed, the blatant liar David Rose from the Daily Fail doesn’t even get basic facts right, such as the nonsensical claim that the MET Office has issued some kind of report. They haven’t. So once again his lies fall apart. It’s time for you science haters to stop spewing lies. And I also have to point out the kind of sources you rely on, such as Monckton, the guy who wants to luck up anyone suffering from HIV/AIDS permanently and keep them away from the rest of the population. And of course David Rose, a clueless “journalist” who has been caught lying so many times it’s really quite amazing. You are not actually addressing anything I have written, or the links that I have provided. I have linked to a translation of a Spiegel article, which is hardly a skeptical outlet, and there are quotes in there from NASA and scientists that accept the halt in warming. Then there is the link to Hansen’s work. As I said earlier, who is the denier now? Yet again you link to the dubious escalator graphic, which appears to be some kind of comfort blanket you turn to when you have no answer. The warming has halted.